TORONTO, July 19, 2018 /CNW/ - Corby Spirit and Wine Ltd. and Golf Canada are pleased to announce that Single Malt Scotch Whisky brand, The Glenlivet, will continue as the official spirit supplier of Golf Canada's National Open Championships—the RBC Canadian Open taking place from July 23-29, 2018 at Glen Abbey Golf Club in Oakville, Ont. as well as the CP Women's Open, from August 20-26 at The Wascana Country Club in Regina, Saskatchewan. "We're excited to extend our partnership with the RBC Canadian Open and CP Women's Open as it allows us to celebrate the tremendous excellence and heritage of golf in Canada with The Glenlivet," says Bryan Lin, Scotch Whisky Brand Manager, Corby Spirit and Wine. "The Glenlivet is the ultimate Single Malt Scotch whisky that was distilled for pleasure since 1824. We are committed to delivering a first-class experience that can be shared by golf fans and patrons throughout the championship with multiple onsite activations and touchpoints." Attendees at the RBC Canadian Open Spectator Village will have the opportunity to sample the award-winning Single Malt Scotch Whisky The Glenlivet Founder's Reserve and take home their own custom label with The Glenlivet Label Maker Experience. Fans can also enjoy a more premium viewing experience inside the Single Malt Super Seats Lounge behind the 16th Hole Green, with feature tastings of the newly launched Ballantine's 15 Year-old Glenburgie Single Malt Scotch led by The Glenlivet Brand Ambassador, Frank Biskupek. Additionally, Corby Spirit and Wine will feature several of its premium spirits at public concessions, including Absolut Vodka, Havana Club Rum, Altos Tequila and Ungava Gin. "We are proud to offer our fans a truly world-class whiskey at both the RBC Canadian Open as well as the CP Women's Open," said Golf Canada CEO Laurence Applebaum. 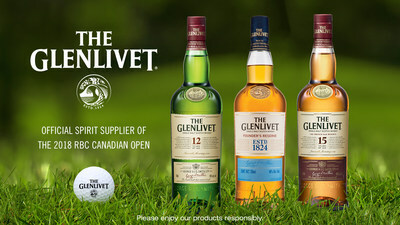 "The tremendous history behind The Glenlivet pairs perfectly with well over 100 years of delivering a premium spectator experience at our historic National Open Golf Championships"
More details about Golf Canada's National Open Golf Championships including tickets can be found at www.rbccanadianopen.com and www.cpwomensopen.com. Part of the FedExCup, stars of the PGA TOUR will compete for $6.2 million (US) at the RBC Canadian Open, July 23-29, 2018 at Glen Abbey Golf Club in Oakville, Ont. Conducted by Golf Canada for more than a century, the RBC Canadian Open provides an opportunity for Canada's top talents to compete against the world's best golfers while also leaving a significant impact in the event's host community. The RBC Canadian Open is proud to support the Golf Canada Foundation as the event's official charity partner. Established in 1904, Canada's national open golf championship is the third-oldest national open golf championship worldwide next to the British Open and the U.S. Open. The RBC Canadian Open is proudly sponsored by RBC, BMW Group Canada, Steam Whistle, Levelwear, Titleist & FootJoy, The Glenlivet, Golf Town, Coca-Cola, Canada Dry Mott's, Commissionaires and the Government of Canada. For tickets or tournament information, please visit www.rbccanadianopen.com or call 1-800-571-6736. Follow the RBC Canadian Open on Facebook, Twitter and Instagram. The stars of the LPGA Tour will challenge for the CP Women's Open from August 20-26, 2018 at Wascana Country Club in Regina. The CP Women's Open is proud to name Jim Pattison Children's Hospital Foundation as the official tournament charity for 2018. Funds raised will be dedicated to pediatric cardiology space as well as specialized equipment and are being matched by CP through its CP Has Heart community program. The CP Women's Open, Canada's National Women's Open Golf Championship, is proudly sponsored by CP, RBC, Steam Whistle, Levelwear, Dilawri Auto Group, The Glenlivet, Golf Town, CVS Controls Ltd., Mott's Clamato Caesar, Regina Hotel Association, Tourism Saskatchewan, City of Regina and the Government of Canada. For more information on volunteer opportunities, tickets or corporate hospitality, visit www.cpwomensopen.com or call 1-866-571-5742. Golf Canada is the National Sports Federation and governing body for golf in Canada representing 319,000 golfers and 1,400 member clubs across the country. A proud member of the Canadian Olympic Committee, Golf Canada's mission is to grow participation, excellence and passion in the sport while upholding the integrity and traditions of the game. By investing in the growth of the sport and introducing more participants of all ages to the game, our goal is to be relevant to and respected by all Canadian golf enthusiasts from coast to coast. For more information about what Golf Canada is doing to support golf in your community, visit www.golfcanada.ca.